KGBV schools recruitment is CRT Telugu, CRT Hindi, CRT's, Specialist Officers, PET, PTI Part Time Instructors of Works Education, PTI of Arts Education and PTI of Health and Physical Education. 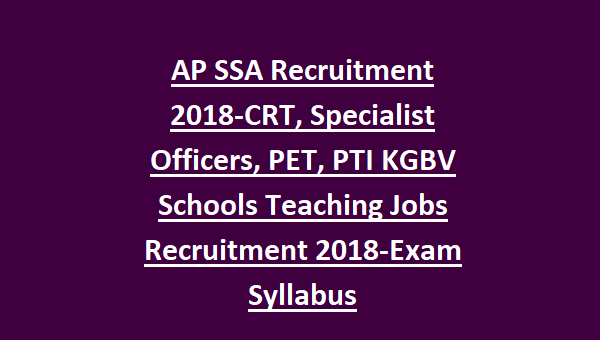 There are total 1866 teaching posts in this AP SSA Recruitment 2018. Selection for this AP SSA, KGBV Schools Teachers jobs will be held on basis 100 marks aptitude test. These vacancies are purely on contract basis for an academic year only. It may be renewed based on candidates performance in the previous year. 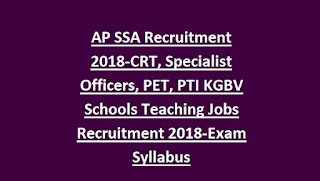 More information about these Teachers jobs in AP SSA, KGBV Schools recruitment post wise vacancies, district wise vacancies, qualifications are updated below. There are 1866 Teaching Posts in this AP SSA Recruitment for Kasturba Gandhi Balika Vidyalayas. Upper age limit as on 01-07-2018 is 39 years and lower age limit is 18 years. For SC/ST/BC candidates age limits are 18-44 years and for PH candidates 18-49 years. Candidates selection will be based on 100 marks objective type written exam. Based on merit in written exam only candidates will be selected for the above said posts. Written Exam syllabus covers the topics of Teaching Methodology, AP Current Affairs, Basic Telugu and English Language. Candidates who interested AP SSA KGBV Schools Recruitment of PET, CRT, PTI and Specialist Officers teachers jobs candidates can submit their application form to respective district selection committee as per given dates.